Last weekend, I did a piece on Missouri’s Charter Schools. Since, it has been an incredibly busy week for “our” Missouri Congress on the education front, as the rush to privatize begins. The past week’s legislation has widespread implications for the future of our children’s education. It is important to look at the overall picture in order to have a broad understanding of what is happening, with alarming speed, to Missouri’s education system. This week has witnessed a flurry of activity in other areas, as well, which calls into question the legislative agenda of our local representatives and who it is they are serving. Rep. Diane Franklin (MO 155), Rep. Rodney Schad (MO 115), Rep Wanda Brown (MO 116) and Sen. Chuck Purgason (Dist 33) and Sen Mike Kehoe (Dist 6) are our current local representatives in the Missouri Congress. Since taking office, these local representatives have embarked on a radical crusade, with a recent flurry of activity that reflects a very specific agenda. This is a highlight reel of the past week in ‘our’ Missouri Congress. April 16: Missouri Senate endorses legislation that allows employers to not only shift burden of proof for benefit claims to employee, it allows for the UNPRECEDENTED legal ability for an employer to dictate private behavior. It allows an employer, through use of surveillance of social media and other resources, to terminate employees for cause if their personal life doesn’t reflect company values. Pro-corporate, big brother legislation like this will allow an employer to fire an individual for ANY and ALL behavior deemed inappropriate by company standards AND keep someone from collecting their unemploment insurance. April 16: Missouri House endorses new voter restrictions, making it both more difficult for citizens to vote and charging them for the privilege via an effective poll tax. Restricting the rights of American citizens to have a voice in the political process is a hallmark of this agenda, as has been seen across the country. Disenfranchising citizens who suffer the most under extreme, oppressive shifts in policy has historical precedent. Whether it is the Holocaust or Apartheid, the calling cards are unmistakable. April 17: Missouri House endorses further restrictions on abortion. This further illustrates the intent to obliterate the separation of church and state. It speaks to a broader picture of legislating religious doctrine on a population. This also, has roots in history, and brought settlers to these shores. They understood the dangers and loss of personal liberty associated with having religious doctrine forced upon you. They sought to escape that here. April 17: Missouri House backs expanding the probe into test scores and accreditation issues for Missouri schools. This further broadens the search for districts who are viable candidates for seizure by the State and then, the privatized, customized education of our kids. Endorsed by corporate groups, religious groups and lawmakers as the ‘prefered’ investment for our public funds and children’s education, charter school not only opens the door to having our children educated in a very specific manner, it eliminates all other options. April 17: Missouri House moves to criminalize telling the truth. This legislation, which makes it a crime to take undercover videos of farms and ‘agricultural’ sites, is designed to silence ALL media from showing ANYTHING not endorsed by management. The legislation comes at an interesting time as Vermont is poised to take on Monsanto in court and expose their business practices, both at home and abroad. Monsanto, as we know, is a homegrown problem. On the heels of the pink slime controversy, to we want LESS regarding our food supply? As more corporate legislation is passed in this vein, it not only threatens our media into acceptancing these practices, it jeopardizes the health and welfare of ALL of us. April 18: Missouri House: ‘Don’t Say Gay’ legislation, which would criminalize any reference to LGBT lifestyle in schools, is backed for further consideration. This law will enforce through law, religious belief and doctrine. This is legislation designed to legalize discrimination and hatred toward those people who do not conform to an ‘accepted’ behavior and lifestyle, as dictated by a specific religious code. April 18: Senate Bills 576 and 677, passed by final vote, allows the privatization of our schools and the education of our children to begin, pending House approval. Would anyone like to guess what the final product will look like? The Missouri Congress has provided ample evidence in the past week to draw a reasonable model, as last week’s piece predicted. We will have school districts increasingly dominated by corporations and corporate policy instead of the needs and welfare of children. We will have school districts infused with private money and private rules. We will see religious doctrine infused with our children’s education. These institutions will endorse discrimination and prosecution of those who are different and have behaviors, lifestyles and points of view that do not conform to religious doctrine. We will see the erosion of the barrier between church and state. It is being assumed by those who would use it to their own ends, to enforce their own set of principles on a population. What most of us under the influence of the Missouri Ministry of Truth have not been told, is that there are obvious ties between the current path of the Missouri legislature and the special interest group ALEC. ALEC, or the American Legislative Exchange Council, seems determined to help guide us own a particular path and the legislation listed from the past week reinforces the article’s assertions of the corporate influence over our legislative process. It would appear that most Missourians are facing, as much are most of the citizens of this nation, a clearly defined case of taxation without representation. Votes from our national politicians and rulings from our federal judiciary have, in recent months have allowed for the expansion of a secret police state, complete with drone surveillance, strip searches during all arrests, including those arrests made during protest against those in Secret Service protection; warrantless access to citizen’s information, indefinite detention without charge, warrant or trial; forced labor, justified as critical to ‘national’ security needs, the expanded role of the CIA, including the previous illegal operation on United States soil and the list goes on. They are serving their corporate masters and they will use the military and police to enforce a rigid, narrow doctrine of extremism. Religious doctrine, corporate will, enforced at gunpoint on a population legislated into subsidizing crimes against humanity. We have seen this before as well. 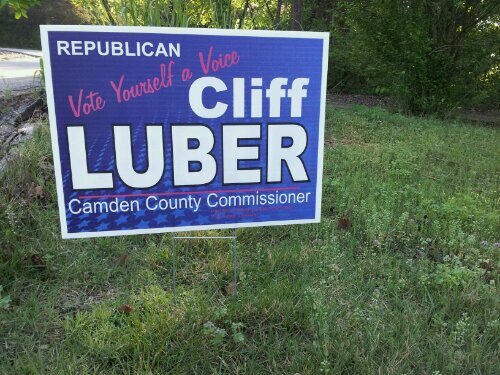 Here, in my own community, Cliff Luber aka the Ayatollah, is running for Camden County Presiding Commissioner. American Spring has pointed out the many and obvious associations between the Ayatollah and the agenda to enforce religious doctrine as state law. The Ayatollah does not stand alone however, in promoting this agenda. Jane Boyce, of the Ayatollah’s Lake Area Conservative Club, has been vocal in support of both promoting religion as law in our schools and of the secession of our state. It is ironic that in the pictures she has chosen to accompany her letters, she is posed in front of shelves of encyclopedias and law books, when in fact she would likely prefer to see the ‘Imperial Judiciary’ done away with. One can only assume that, as Missouri lawmakers are still considering a measure that sets the stage for secession, Jane is also in favor of the House decision to accept gold as currency, in lieu of dollars. The blue signs that have appeared around town represent the local face of an extremist agenda that more closely resembles Saudi Arabia or Iran than Ohio. The Ayatollah and his supporters have led us down a historical path, all the while claiming to be patriots. This also, has roots in the past. Nationalism was a critical tool in reshaping Germany during the rise of fascism. This is for the members of the media out there who have taken the time to read this. In an effort to be fair I would like to thank @LakeNewsOnline for choosing to put Luber’s unflattering letter back online. I would also like to thank them for covering some of the critical moves by the Missouri legislature in this piece. This is a nice change. Follow me on Twitter @AmericanSpring as I always answer shout outs and never shy from good conversation. A few weeks ago I spotted an article in the Atlanta Journal Constitution concerning several Missouri school districts. These districts were facing the loss of their accreditation due to failing scores and fraudulent test results. Thanks to ‘No Child Left Behind’ laws, these failures now allow for government money to funnel to corporations via the privatization and customization of your child’s education. Since a good number of us have kids in school, it is good to know what we are getting for our money. Charter schools have long enjoyed a marketing bonanza in the media, and the positive coverage initially of charters as a preferred educational alternative has paid off. As more and more public schools fail, more and more charters have appeared in replacement, scooping up our money under the argument of having a better product. Initially, many buy in as they see a public education system that is failing. With charter schools as the viable and agreed upon lone alternative, what you are left with in the aftermath is a corporately owned education farm system that answers not to the people of the district, but to the constant profit motive. The first, most glaring example of the dangers of making our kids’ education a profit center, comes via @Banditelli who was kind enough to share them with me. A look at THIS ad and all appears to be in perfect order. For many parents, desperate to provide their children an opportunity at a better life, it can look like a beacon of hope in an otherwise gray world. Then you look at THIS ad and see that the young lady featured must get around, going to all these different schools. You know where this is going to lead. There is nothing to stop this level of corruption, once the competition is eliminated. Another major player in the private education industry is Rupert Murdoch. Murdoch, whose News Corporation empire is being rocked by the largest government corruption scandal in the history of the UK, via Fox News, is no stranger to promoting Christian extremism. Consider that even Mike Huckabee, gentleman preacher-turned-politician, is heavily invested in promoting a particular point of view to serve his own profit margin. He is well-known for attempting to assign religious intent to our founding fathers and our founding documents. Huckabee has ownership of a company that produces cartoons for young children that reinforce this fantastical fallacy of our history. Look at recent developments in Kansas City’s public school districts. Do you think it’s an accident that Google provided the Kansas City area with a new, advanced internet service? As the UK scandal has proven, Murdoch expects services to be rendered for his payments. Once you eliminate the competition, public schools, you silence an electorate’s voice in the end product. We become consumers, and if we have complaints, we will get the company line ‘your concerns will be taken into consideration’. It is not a surprise to see our local link to extremist viewpoints, Eagle Forum, is in strong support of charter schools. Not surprising that she also instructs people to teach their own children to read by the first grade using phonetics. Especially after a guy I work with told me this past week, that he saw on the news a report that they were going to start eliminating Kindergarten and 1st Grade programs across MO. Yes, there are bad teachers. A bad system with little compensation results in poor performance. The remarkable thing is, in spite of the mammoth task and responsibility our teachers have, they are constantly made to be an enemy in a never-ending marketing campaign designed to achieve a particular result. They are made out to be villains who are somehow getting rich off our tax dollars when in fact the exact opposite is true. The fact that bad teachers are an underwhelming minority is an absolute testament to the men and women who have our nation’s most important job. They are going broke trying to teach too many kids with too few resources thanks to our corporate politicians. It is they, who have squandered our education dollars to achieve a particular result. They are all working to make education another profit center in their perfect corporate union. None of this serves us or our kids. None of it serves us. It DOES serve a select few, who would condition our children to accept the lowest standards. THEIR agendas require blind acceptance and is not without historical reference. We all remember the brown shirts of the Hitler Youth. That is what they conspire to create, a willing populace ready to turn a blind to the truth of their empire’s own evil deeds because it satisfies a specifically cultivated sense of religious superiority without the application of morality. Much has been made of corporate influence and corruption in Washington politics. It is understood now, in our post “Citizens’ United” world, that money donated directly equates to access to and influence over, politicians. There have been generic cries of outrage over a system that favors oligarchs, but we are rarely offered a hometown look at these relationships and the repercussions they have on the community at large. Fortunate then, that as I was sitting at a traffic light, staring me in the face was the perfect example of this destructive parasitic relationship. High Brothers Lumber and Home Center has been a member of the Camden County business community since 1979. While no one can say for certain how long ownership has endorsed stealing the liberties of their clients and customers, it can be said that their recent enthusiasm for these extreme ideas is bubbling over. A trip to their place of business, located on South Hwy 5 just outside of Camdenton, Missouri, finds one under the Gadsen flag, the chosen symbol for Tea Partiers in the area. Its slogan, ‘Don’t Tread on Me’ matches the view of High Brothers Lumber and Home Center ownership perfectly, as I learned sitting at the aforementioned traffic light. In front of me was one of High Brothers’ trucks, painted up in a gaudy style that resembled a NASCAR machine. On the left side of the rear bumper however, was something that stood out like a blazing neon sign. There, displayed proudly for all to see, was a sticker endorsing Vigilant Vicky Hartzler of Missouri’s 4th District and her ongoing war against liberty. Hartzler has voted in favor of making it a felony to protest anyone under Secret Service protection. She has voted in favor of the NDAA, which allows the government to apprehend and detain you indefinitely without charge or warrant. She has voted to extend the Patriot Act. She has had Missourians arrested in her office. Her town hall meetings, with the doomsday projections of our debt, armed police guard and threats have the look and feel ofGermanyin the late 1930’s. No gays. No contraception. No abortion. No Medicare. No Medicaid. No Social Security. No rules for business, at all. No public post office or education. No public welfare, only corporate. Yes, to the constant state of war. Yes, give more breaks to Big Oil. Yes, impose a religious belief through legislation. Yes, sell off government holdings to private companies. Yes, shred the Constitution and the Rights bestowed upon us by birth. Yes to oppression. Yes, allow big banks to go unpunished for the theft of our treasury while writing laws to allow for even more fraudulent practices (JOBS Act). Yes, cut tax rates on corporations and the wealthy. Yes, pass that burden on to the rest of us via a 10% income tax no one is exempt from. We expect no more from Vigilant Vicky Hartzler, who was paid $1,485, 076.00 to run for office and then to cast votes in favor of the aforementioned positions. In fact, of all Vicky Hartzler’s top contributors for the above time frame (2010 election and voting through mid 2011) with one lone exception, were from OUTSIDE Missouri’s 4th. From them, I would expect such impersonal treachery. High Brothers Lumber and HomeCenter is the local face of Vicky Hartzler, while she is whoring out our country and legislating us all into submission. From them, I would expect better.